I'd say that this look is my ideal everyday warm weather outfit. 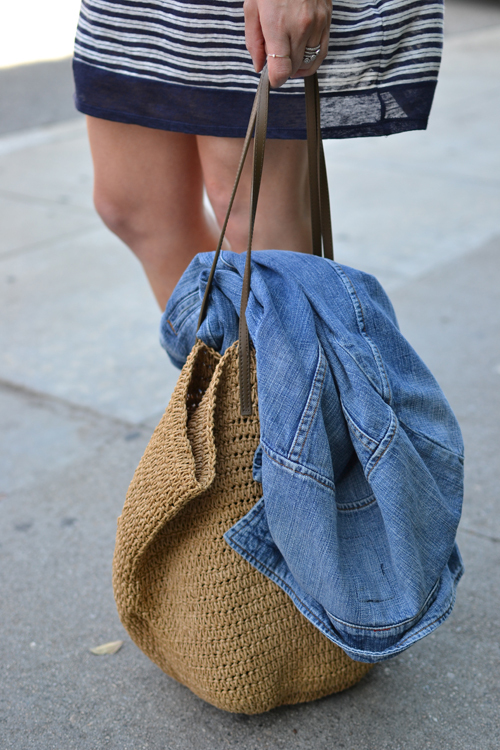 You can never go wrong with stripes, a straw tote and a classic denim jacket. The weather is supposed to be gorgeous here this weekend and I already know that this dress will be getting quite a bit of use. Have a great weekend everyone! Such a cute dress. I am a fan of stripes too. You look great. I gotta go check out that dress. This is definitely my idea of a great casual summer outfit! You look adorable... love the hat as a finishing touch. This is such a summery look. I absolutely adore that dress. This is basically my summer uniform! ;) Love it! Happy weekend, darlin'! Me encanta el vestido y el bolso! I like the airy-ness of the striped dress Audrey.....cant wait for summer in LA!! Such a cute striped dress, Audrey! Great for the warmer weather! Lovely outfit, just my style! This really is the perfect outfit for a nice summer day! Love it! The perfect dress! I love stripes! I love this look. So casual and pretty. I love the bag, it'd be great for the beach! This dress looks so easy and comfy! As a fellow California girl, this is right up my alley. It's something I wear often in Summer. Love this! So relaxed but put together:) Have a great weekend! Where are the rings from?? Love! The one on my index finger is by London Manori and the rest are from XIV Karats in L.A.! Of course! LOVE XIV Karats! You should do a close up of your jewelry- I'm always curious about the rings you're wearing in your posts! The look is very cool and chill, love the stripes and denim combo. Nice summer outfit. And thanks for your comment on my blog. Would you like to follow each other? I 'd love to. Oh, I love your blog. I follow you right now! definitely a summer go-to outfit! Great styling with the straw bag and hat! Gosh, I have to get such a dress; it surely looks amazing with the denim jacket! That dress needs to be made in every color and then appear in my closet. I love that you can use it as such a great base and add layers and accessories to create new looks. Lovely dress, cool & chill look. Love the hat. I love this, very chilled and nautical! Love this look. It looks stylish and effortless at the same time.